Buying the right filter is one of the most important aspects when setting up your outdoor pond. However, what is the best pond filter on the market today? With various multi-filtration options, and additional features such as UV clarifers it can be a real mine field, especially if you are doing this for the first time. Then there’s the added variable of the type of fish you plan to stock and of course, the gallon capacity you are dealing with. Our top pick best pond filter is the Laguna Pressure-Flo 700 UVC system. As an all in one solution providing the much sought after triple filter protection, it really is difficult to beat. The Laguna Pressure-Flo contains mechanical, biological and UV sterilization to help ensure your pond water remains safe and clean. The Pressure-Flo is an inline filter system that is nice and easy to install. If your plan is to use the filter with an existing set up, you simply need to cut a waterline from the pond pump and connect up the system with the convenient Click-Fit connectors. So installation is simple; but what about performance and overall maintenance – how reliable is the 3 filter configuration? Well to be our top pick pond filter the Laguna clearly excels in this department. One of the reasons is due to the fact Laguna have included a patent-pending Backwash Cleaning System to the unit. This unique feature allows for thorough cleaning of the surface of the foam filters without the filter casing having to be opened. In other works, you can utilise backwash cleaning to maintain the filter in minutes without opening the lid. Furthermore, an easy-view cleaning indicator tells you exactly when it is time to perform the operation. The water flow on the Laguna comes in at 333 gallons per hour (suitable for high load of fish in sunlight). For setups that include low load fish in the shade, water flow can be increased to as much as 660 gallons per hour. It is important to understand the appropriate use for the Laguna Pressure-Flo. This filter is designed to be used with fresh water ornamental ponds (temperature from 39.2° to 95° Fahrenheit). You will also need a pump. The manufacturers recommend the Laguna’s Max-Flo (sold separately) for this purpose. High performance 3 part process freshwater pond filter. Excellent cleaning indicator that informs you of when maintenance is required. One customer had a situation where the tubing leaked on installation, (recommends Teflon tape to patch up). PH levels have been reported as difficult to maintain when using the filter and dealing with delicate Koi. The Laguna Pressure-Flo filter system is a top unit for freshwater ponds with or without fish. 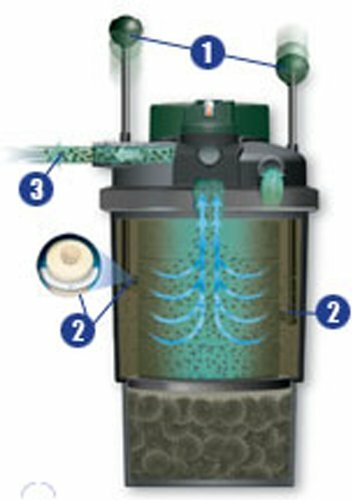 The 3 part filter process will help ensure that the water remains clear, healthy and algae free. The backwash cleaning and comprehensive LED cleaning indicator also makes maintenance quick and easy. What more could you want from your pond filter? Highly recommended. The BioSmart 10000 is another worthy entry to our top 5 list. OASE have opted for a multi-stage filter system that incorporates both mechanical and biological filtration. The target market here is those with medium sized ponds stocked with (in their words) a moderate biological load. In other words not cram packed with fish. If you are installing the BioSmart in a pond without fish, you can do so inside a pond up to 10000 gallons in size. As we explained briefly in the buyer’s guide above; the biological filtration works by having the water flow through a series of special bacterial filter foams. In the BioTec 1000 the unit is designed so that harmful ammonia and nitrites are able to settle inside to go through a biological conversion process. Over time, these harmful waste substances are converted to nitrates, which actually support plant life in the pond. For more convenient maintenance the system also features a built-in cleaning mechanism. Not quite as revolutionary as the Backwash system from Laguna, the system does still allow for a thorough cleaning of the filters without the need to remove them. The manufacturers recommend a pump size capacity of 1600 gph to 3000 gph for optimum filter performance. A number of customers have found the included instructions to be very poor and hard to read. If you are looking for a predominately biological filtration system for your pond, OASE may well have come up with the goods in the BioSmart 10000. This compact and efficient multi-process filter system performs very well indeed. Best Choice Products have manufactured a wide range of useful tools for the home and garden. While their broader scope may put some people off with regards to assumed expertise in a particular product space; the fact is they very often release reliable goods at an affordable price. Does their 4000 gal Pressure Bio Pond Filter follow the same approach? In terms of affordability it certainly does. The Best Choice Products Bio System is one of the cheapest pond filters in our top 5 list. Designed for filtering normal pond water, the unit has sufficient capacity for smaller sized ponds and is able to run at 2500 gph (with heavy fish load) and 4000 gph on ponds with lighter fish loads. Again a multi-filtration approach is taken, with the unit even housing an integrated 13W UV clarifier – a nice addition for a filter in this price point. Other features such as the UV lamp indicator, and indicators to let you know when it is time for the filter sponges to be cleaned, make the Best Choice really good value for money option. Bare in mind that spare parts are not available for this filter through Best Choice Products. A number of customers have had to dispose of the product after a small part failing. Due to the low price the build quality is inferior when compared to the more premium selections in this top 5 round up. If you are looking for an easy to use and light on the pocket bio filter for your pond, this Best Choice Products is definitely worth a look. The inclusion of a 13 UV clarifier and the fact this can be used with ponds stocked with light Koi have made this a regular seller. Just consider the lack of available spare parts before you buy however. The Fish Mate 3000 opts for a dual filtration system (so no real surprises there). The mechanical and biological filtration works the same way as described elsewhere in our review round up. The 3000 gallon capacity filter is recommended for ponds between 750 and 3000 galons (depending on the amount of fish being stocked) and features multi-sized inlet and outlet areas that are adaptable to 3/4″, 1″, or 1-1/4″ flexible hose. It is worth knowing however that the required hoses and hose clamps are not provided with the system on purchase. These have to be bought separately and will need to be BPT (British pipe thread) compatible. The unit is versatile in the choice of configuration in that it can be fitted above or below ground. So far so good. However, what really makes the Fish Mate stand out is the patented automatic cleaning system. The manufacturers call it Powerclenz. This excellent feature allows for very easy cleaning and maintenance. Instead of removing the media for cleaning, you simply twist a knob so that the filter foam is squeezed from within the unit. Despite the fact the relevant tubing isn’t supplied, Fish Mate do ship the filter with their very own Fish Mate SUPRA+ biological filter media. You have a pond at the higher level of the recommended capacity (i.e hitting the 3000 gallon mark), the filter may not perform as well as it should. Doesn’t have a UV sterilizer built in. The Fish Mate 3000 is a good dual filtration pond filter that benefits from ease of use, installation and maintenance. However, bare in mind that this is recommended for smaller sized ponds (less than 3000 gallons) only. The final entry in our top 5 list is the Tetra Pond BP1500-UV Bio-Active Pressure Filter complete with UV Clarifier. This is another smaller capacity filter designed for ponds up to 1500 gallons. As the name suggests the filter utilises a biological filtration system. This works via what are called open profile bio-activators. These are built to provide increased surface area for filtration, as well as allow water flow to all surfaces as part of the inbuilt cleaning process. Mechanical filtration is also built in of course. The unit has a backflush valve for fast cleaning of the system. Automated clear and healthy pond water is the name of the game here. The all important Ultra-Violet Clarifier is also built in. This ensures that the suspended algae (the annoying bacterial element that produces green pond water) is kept at bay. TetraPond include a generous 2 year limited warranty on the unit, however this does not include the replacement of the UV bulbs. Some customers have had issues with the backwash cleaning system. Not as fast and easy as they expected. The TetraPond BioActive is a well designed pressure filter that includes great features, especially in terms of easy maintenance and cleaning. If you have a smaller sized pond and want hassle free filtration, this comes highly recommended. When in the market for buying the best pond filter system there are many things you need to consider. First off, you need to evaluate your needs. The two main points here are the types of fish you wish to stock and the size of the pond. If you are planning on installing the filter yourself you will also need to think about your skills; how easy will the system be to set up? What kind of maintenance is involved when it is place? Essentially, your aim is to have a pond with clear water and healthy fish with minimum fuss. Of course, with the various pond filters available there are a number of ways of achieving this. The following are a list of the main types of pond filtration systems currently available. The best filter for a koi pond are pressurized filter systems. These are also a popular choice in heavily stocked water gardens. The reason is simple. 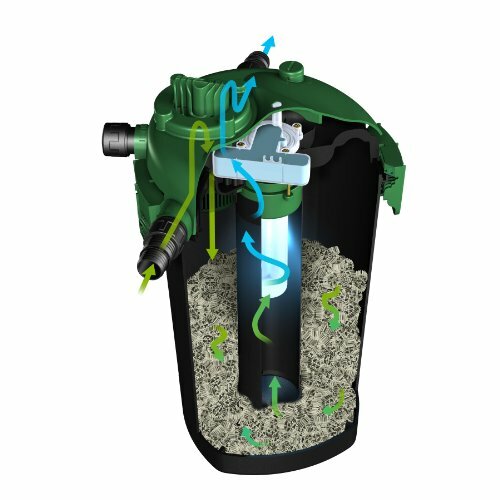 With a design that incorporates both mechanical and biological filtration you have one of the most reliable system types around. They are also easy to use. They can be fitted as part of an existing pond set up with ease and are very simple to clean. Filter placement is versatile too, as you can position them above or below the water level. In fact, no matter the type of pond you have, fitting a pressurized filter as your primary system is definitely recommended. On the downside, you will need a pump with sufficient pressure to prevent clogging. If you purchase a filter with a built in blower (to move the media around and prevent clogging) you have to bare in mind the need of electrical supply line to power the system. Much like the bead filters, canister pressurised filters take a mechanical and biological approach to pond filtration. In fact the best pressurized pond filter for small ponds is the canister model. Inside the unit a foam media does the all work of filtering out debris. However this does mean regular hands-on action on the part of the owner. It will be your job to clean the filter media by removing it from the unit, (or using the self-cleaning mechanism that the filter may contain). If you opt for one of these you will need a low or medium powered pump. In pond filters are probably the cheapest you can buy. They are also very easy to install. However, the trade off is the way the filter has to be maintenance. Cleaning will actually involve getting your hands dirty – you will need to reach to the bottom of the pond where the unit is installed, pull out the filter and retrieve the media from inside. That being said, the fact you can even make home made pond filters (check this youtube video) makes them a popular choice for many. In our opinion the in-pond system is the best filter for small ponds with low fish stock levels. Box filters utilise a compartmental design that allows the water to flow through multiple sections of filter media. This type of system means areas of the filter can be cleaned independently. In other words when it comes time to clean the mechanical filtration, the areas that house the biological filters can be left alone, (assuming the pads do not need cleaning or changing). Box filtration units should be positioned at the high point of a system due to the fact the flow out relies on gravity. (See example box filter set up here). Skimmer filters are another extremely popular choice that is well covered by most of the major filtration brands, (Savio, Aquascapes, and Atlantic have all released skimmer filter units). The skimmer system works by skimming the water from the surface of the pond in a suction motion. When debris is drawn towards the filter it is collected in a basket. The plus side of using the skimmer is the ease of maintenance. The collected debris is conveniently placed for emptying. It is also a lot easier to reach the pump when you need to; the unit is a whole lot more accessible. The final type of filter in our guide list is the waterfall system. As the name would imply, the waterfall filter is raised above water level so that the escaping water (once passed through the filtration media) creates a trickling waterfall effect. However, for positioning you do need to make sure the bottom of the filter is submerged so that the water can enter, (meaning you need to keep an eye on your ponds water level – if it drops to low, the filter will not be in a position to work). The media has to be removed from the unit for relatively frequent cleaning as they can and do get clogged. Related Content: What is the best pond liner you can buy in 2019? In our explanation of some of the filters systems above you would have come across the different methods of how each unit keeps the water clean; i.e mechanical, biological and UV-C. Some filters will use one, or more of these methods within the single unit. (The more premium products will utilise all three). Most filter systems will incorporate some form of mechanical filtration. This is inherent in the shape and design of the filter and works to trap larger waste materials coming from the pond. On the best pond filter systems this debris is accumulated within a compartment inside the unit that is readily accessible for easy cleaning. The biological filtration within a filter system is there to convert the toxic by-products of fish metabolism; i.e their poop and other organic waste. Intake – This is where the water is pumped into the filter system. Mechanical Filtration – As described above, initial debris removed by filter sponge pads. Bio-Filtration – Water trickles over bio-rings (or cells). The surface area encourages aerobic bacteria to thrive, (an inlet may supply oxygen for aerobic bacteria.) The bacteria on the bio-rings convert ammonia into nitrites and then nitrates. Discharge and Nitrate Removed – Purified water leaves the filter at the bottom of the unit and into the pond. Aquatic plants can easily remove the nitrates from the water through their own natural biological processes. In essence, the water contaminated by organic waste passes through the filter and comes out the other side as a far less harmful substance. The best pond filters will actually have an indication system built in to tell you when a filter media needs to exchanged for a new one. Filter units that incorporate UV-C filtration are a recommended purchase, especially if your pond is prone to algae growth. The UV-C system works to inhibit single-celled algae growth so that your pond water remains clear and healthy for the fish that you stock.